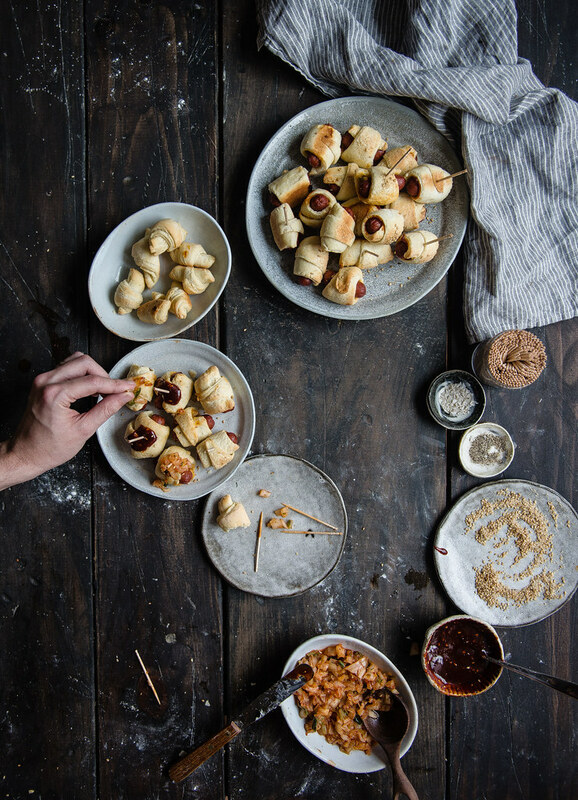 Call me a super literal thinker, but for a Pig & Quill baby shower, some version of pigs in a blanket was the first thing that came to mind for me to “bring.” (Little piggies and baby blankets! The word pig!) Given Emily’s love of hot dogs with Asian flair, B2’s ever-eagerness for kimchi, and a bottomless tub of gochujang in the fridge, this vaguely Korean rendition seemed like the perfect thing to try. The gochujang sauce is straight from the bibimbap staple here (throwback alert! ), but the kimchi relish was a new, delectable invention I found through Marja Vongerichten’s The Kimchi Chronicles. I couldn’t decide which one to tuck inside the “blankets” and which to serve on the side, so I did some of both, but either would work. I think the most important part is just slathering on plenty of each. 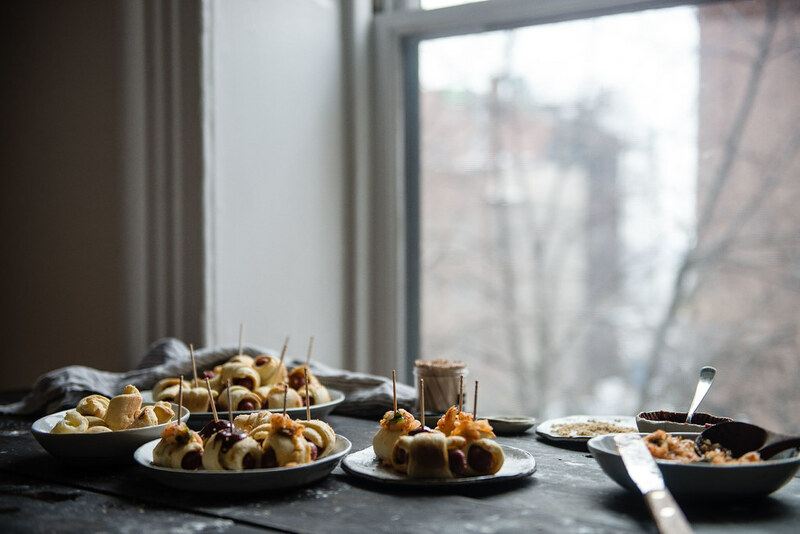 The result is everything I love about these bite-sized party staples — fluffy, warm dough-blankets, snappy mini-dogs — but with a tang from the kimchi and a sweet-smoky heat from the gochujang that gives them a spicy update. And the rest of the party is here! Kimchi relish from the Kimchi Chronicles by Marja Vongerichten; crescent roll dough adapted from Home Cooking Adventures and Half Baked Harvest. 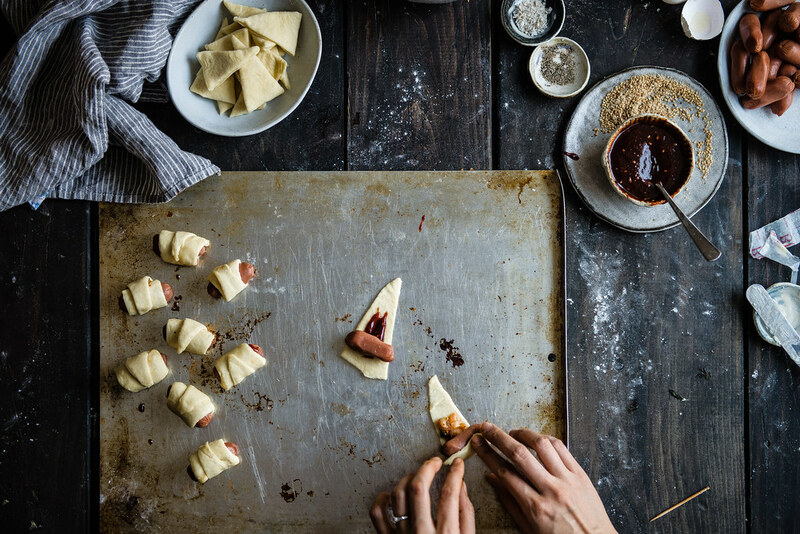 Feel free to use Pillsbury ready-made crescent roll dough or your favorite recipe instead. Set out half the butter (2 tbsp) at room temperature and let it soften while you prepare the dough. In a medium bowl or liquid measuring cup, heat the milk until warm to the touch but not hot. Add the sugar and stir to combine, then add the yeast. Let the milk sit for about 5-10 minutes, or until the mixture has foamed. Meanwhile, combine the flour and salt in a large bowl. Once the yeast is foamy, add the egg and whisk to incorporate, then add the mixture to the flour. Using a wooden spoon, stir the dough until it comes together into one solid mass. It should be shaggy and soft. Turn the dough out onto a lightly floured surface and continue to knead with your hands, flouring as little as possible and only as much as needed to keep from sticking, for 2-3 minutes. You should feel the dough start to tighten a bit and become slightly more difficult to knead. Add one tablespoon of the softened butter and knead until incorporated. 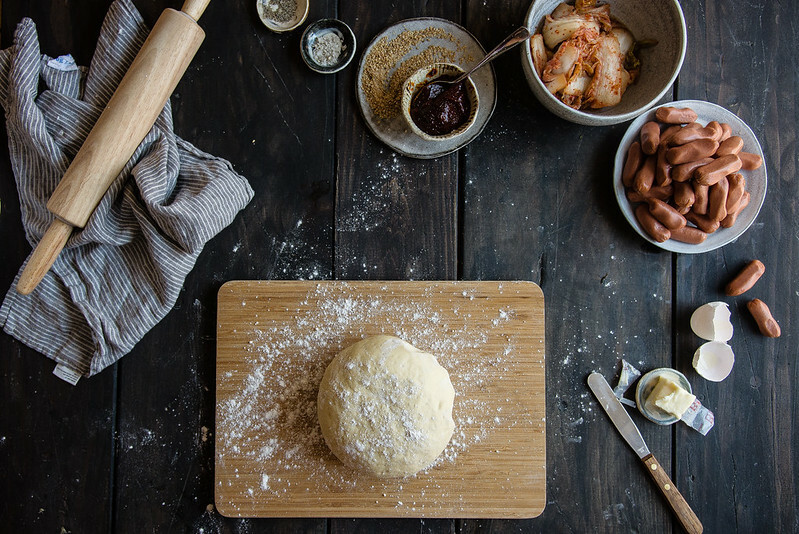 It will be messy at first, but just keep kneading and it should come back to a soft, light dough. Add the second tablespoon of butter and knead again until incorporated. Continue to knead for 6-7 more minutes. If kneading in a stand mixer, knead with a dough hook on medium for 5 minutes. Place the dough in a lightly greased bowl, cover, and let rise in the refrigerator overnight (or at room temperature until doubled). The next day (or once risen), let the second 2 tbsp of butter come to room temperature and soften. Remove dough from fridge and roll out on a lightly floured surface to a large rectangle about a quarter-inch thick. Spread the softened butter across the dough, leaving an inch border on all edges. Fold the rectangle into thirds, letter-style, with the butter in the center -- fold the bottom third up, then the top third down over that. Pinch the edges to seal the dough rectangle, then cover with plastic wrap and place in freezer for 10 minutes. Roll the dough out to a long rectangle, taking care not to burst the sides of the packet, and fold the dough letter-style, into thirds, again. Place back in freezer for 10 more minutes. Finally, roll the dough out one more time, fold one more time and place in the freezer for a final 10 minutes. During this last rest, make the kimchi relish by mixing the vinegar and honey with finely chopped kimchi, and make the gochujang sauce by whisking together the gochujang, soy sauce, sugar or honey, garlic, sesame oil, and roasted sesame seeds. Set both aside. Pat the cocktail franks dry and prick a few holes in each to prevent bursting. Preheat oven to 350 degrees F. On a lightly floured surface, roll the dough out into a rectangle about 1/8-inch thick. Using a pizza cutter or sharp knife, cut the dough into long, narrow 3-inch triangles -- I did so by slicing into two-inch wide strips of dough, then cutting in diagonals. 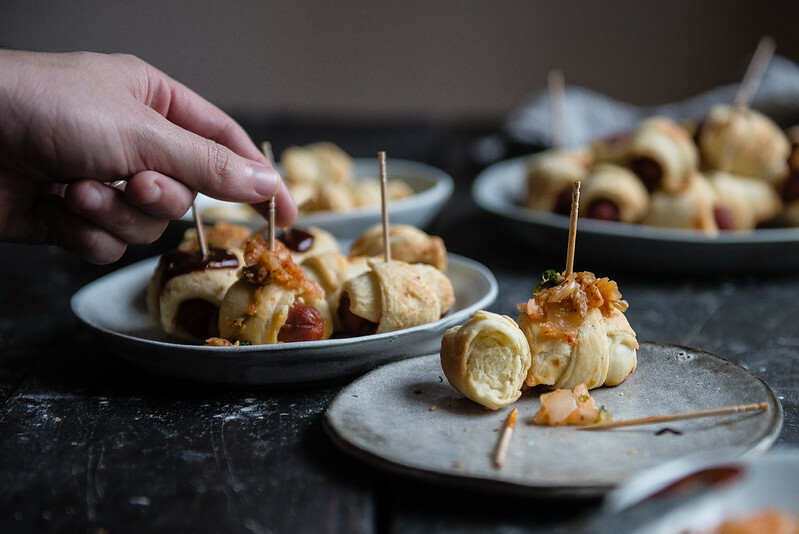 To form the pigs in a blanket, place about a half teaspoon of kimchi relish or gochujang (I preferred gochujang inside the blankets and kimchi relish on top when served, but either will work) on a dough strip, then place a cocktail frank on the widest end of the strip and roll up. 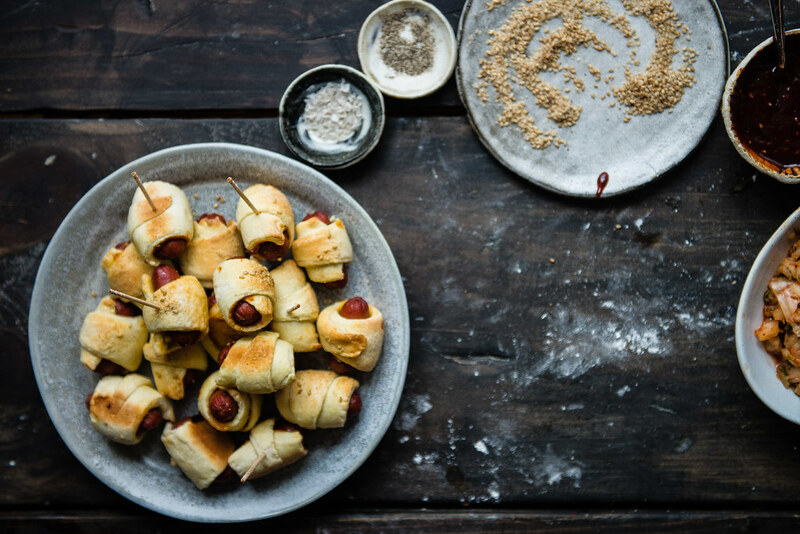 Place the rolled franks on a baking sheet a few inches apart. If desired, brush with extra sesame oil and sprinkle sesame seeds on top. Bake the piggies for 12-15 minutes or until golden brown. Serve with remaining gochujang sauce for dipping and kimchi relish to top. Enjoy! Oh my gosh those look amazing!!! These look gorgeous! I love gochujang, so I’ll have to try this! Yay! Thanks so much 🙂 I think I could eat gochujang on anything! OMG you’re SO RIGHT!! Hahaha how genius, Ursula!!! these are awesome! stunning photos! and baby pigs in a baby blanket for miss pig n quill … dude… you are the MOST thoughtful. Cynthia, you are a gem! I wanted to come tell you that I love this recipe (so many heart-eyed emojis!) and I always appreciate the thoughtful and nice things you say 🙂 To me and to everyone! And I wish we could share these and with a side of some shishito peppers! Nicole, you are so kind! Right back at you — thank you so much for such sweet words. And I could definitely go for a big platter of those shishito peppers right about now! What a lovely tribute. 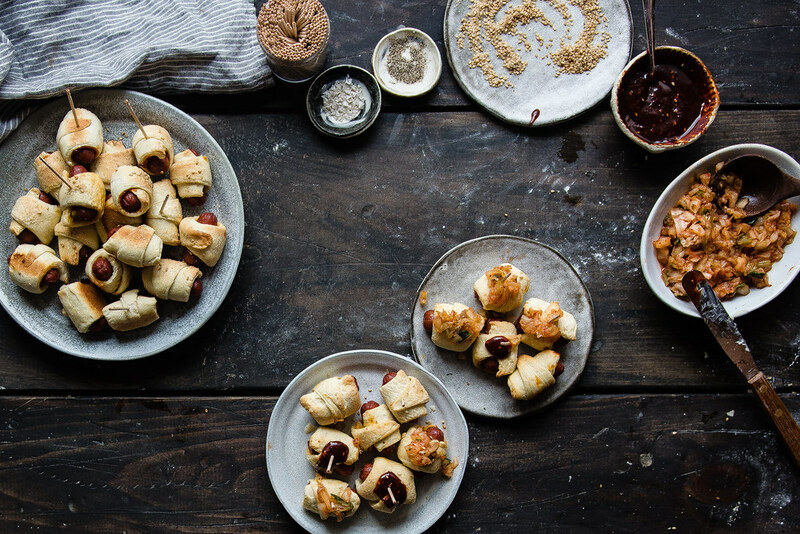 As you may know, I’m obsessed with all things Korean so I love the idea of Korean-izing pigs in a blanket. LOVE! Hot damn GIRL, you come up with the best fusions. This is everything I want and like from all corners of the culinary world. You’re the best!!! And congrats on your Saveur nod!!! Can we finally hang out IRL???! Ahh congrats to YOU, talented lady!!! So happy to see your name up there, it’s so so deserved!! You’re too amazing, my friend. And YES, IRL HANG. I can’t wait! The piggies in a blanket are perfect. 🙂 And you always put your own spin on everything! I wish this baby shower were IRL so I could try all the wonderful and creative treats everyone made for Emily! I know, right?! It’d be the best baby shower ever. Thank you so much, Ileana!! 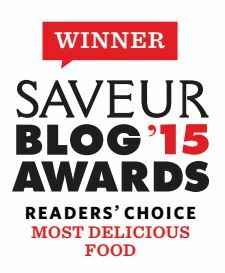 Congrats on the saveur nominations!!! I wish I could be in the “delicious food” category! Congrats to YOU, Mandy!!!! I was so happy to see your name up there, it’s so SO deserved — I’m crossing my fingers we get to meet this year! Love times a million! These piggies are too cute, and that sauce… OMG, I’d want to lick the bowl clean. 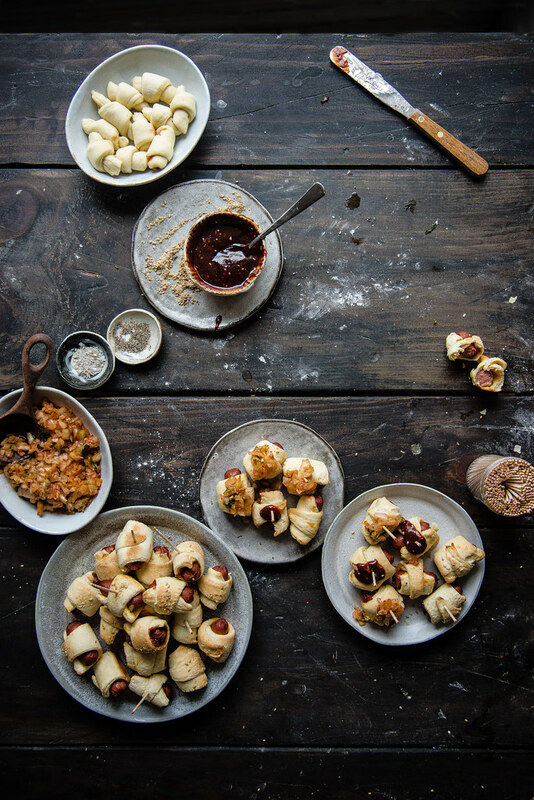 Beautiful photos and food styling! Ohhhmahhgoodnesss you know this is my kind of treat!!!! They are so perfect and adorable, great job!!! This looks amazing! What an amazing flavour combination! Hi Cynthia! You are too kind! Super congrats to you too for your nomination! 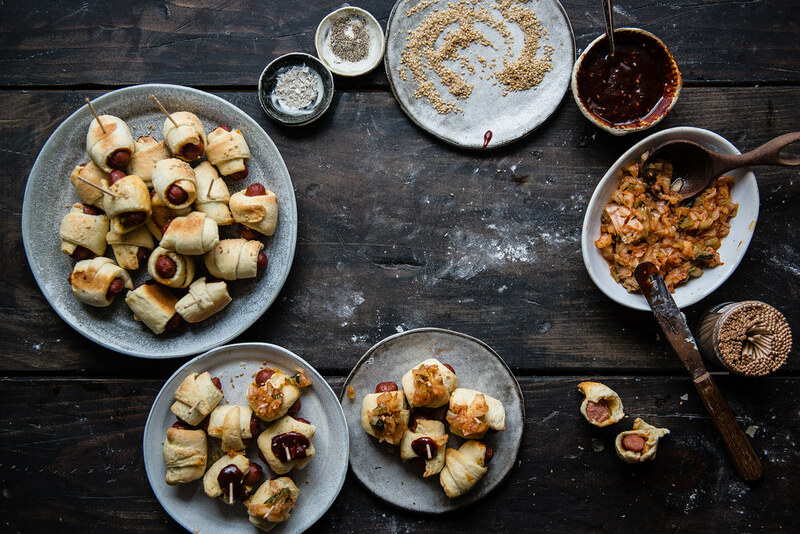 Might I say that these pigs in a blanket definitely look like the most delicious thing ever. Mini sausages are so good wrapped in anything, but omgblahhh, I can’t believe you put gochujang in them, so genius. Hopefully we’ll meet in June! Pigs in blankets = perfect!! Kimchi Relish!?! homemade pigs in a blanket.. Girl, I’ve got to gather my thoughts on this one cause this is nothing but greatness. Ohmygosh, you are the most thoughtful and creative lady around!! The little pigs in a blanket for Em are the cutest and sound the tastiest. I’m kind of obsessing over your kimchi relish right now. Need to make that ASAP!! P.s. 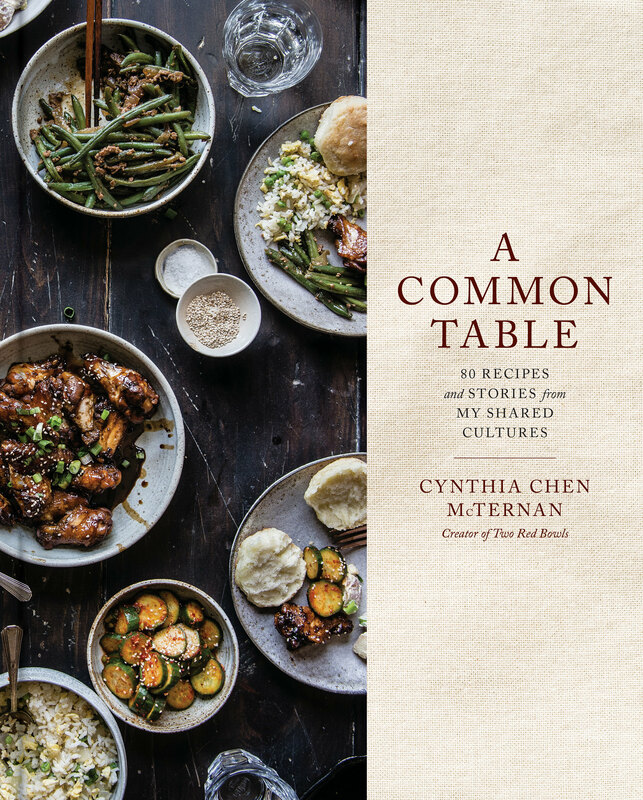 I’m still thinking about these and the kimchi relish and the fact that YOU’RE A FINALIST and I can personally attest to your recipes being the tastiest in all the land. SO DESERVED!!!!! Well isn’t this just PERFECT. You’re a genius. Little Asian-inspired piggies in blankets? Love it. This baby shower was so much fun! Gochujang is pretty much my favorite thing ever. So I am all over this and then some. Man, oh man, like I needed another reason to wish gochujang was kosher. Blargh! These look amazing. I’ll take like 7 please and thank you! Hey girl! Your site looks fabulous, didn’t know redesigned some of the elements! Having just finished up with one myself I know how time consuming it can be, so congrats. And having just bought two bottles of gochujang from Whole Foods last week, I’m putting this on my must do list 🙂 Thanks for the inspo as usual!